The Judges' Trial (or the Justice Trial, or, officially, The United States of America vs.
Josef Altstötter, et al.) 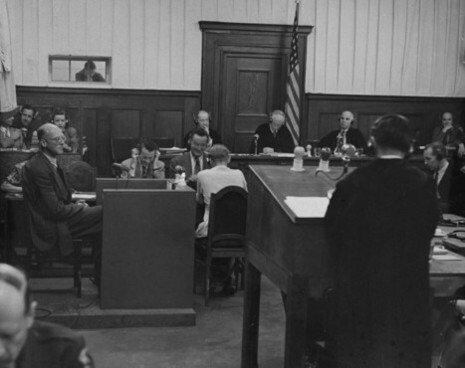 was the third of the twelve trials for war crimes the U.S. authorities held in their occupation zone in Germany in Nuremberg after the end of World War II. These twelve trials were all held before U.S. military courts, not before the International Military Tribunal, but took place in the same rooms at the Palace of Justice. The twelve U.S. trials are collectively known as the "Subsequent Nuremberg Trials" or, more formally, as the "Trials of War Criminals before the Nuremberg Military Tribunals" (NMT). The defendants in this case were 16 German jurists and lawyers. Nine had been officials of the Reich Ministry of Justice, the others were prosecutors and judges of the Special Courts and People's Courts of Nazi Germany. They were—amongst other charges—held responsible for implementing and furthering the Nazi "racial purity" program through the eugenic and racial laws. The judges in this case, heard before Military Tribunal III, were Carrington T. Marshall (presiding judge), former Chief Justice of the Supreme Court of Ohio, James T. Brand from Oregon, Mallory B. Blair from Texas, and Justin Woodward Harding as an alternate judge. Marshall had to retire due to illness on June 19, 1947, at which point Brand became president and Harding a full member of the tribunal. The Chief of Counsel for the Prosecution was Telford Taylor; his deputy was Charles M. LaFollette. The indictment was presented on January 4, 1947; the trial lasted from March 5 to December 4, 1947. Ten of the defendants were found guilty; four received sentences for lifetime imprisonment, the rest prison sentences of varying lengths. Four persons were acquitted of all charges. On February 13, 1947, the U.S. Military Government for Germany created Military Tribunal III to try the Justice Case, the third of the Subsequent Nuremberg Proceedings.